Claude Puel is hoping "magnificent" Leicester winger Riyad Mahrez "gets his head right" and returns to his squad. Algeria international Mahrez, 26, has not played for the club since a January move to Manchester City fell through. 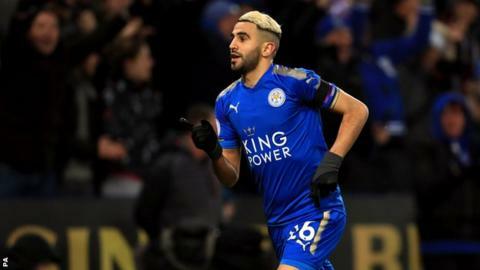 The 2016 PFA Player of the Year had handed in a transfer request, and on Thursday Foxes boss Puel confirmed he would not be in Saturday's Premier League squad to play at leaders City. "I think it is important to look forward," Frenchman Puel said. "Riyad is a magnificent player and he loves football. He loves his relationship with his friends and team-mates," he added. "I think it is important in this difficult time to keep all players, and club, united, to continue the hard work on the pitch. The best way is to come back and enjoy his football. "I hope Riyad can get his head right and comes back with us." Mahrez joined Leicester from French club Le Havre for a reported £400,000 in January 2014. He has scored 35 goals and contributed 24 assists in 127 top-flight appearances and was named PFA Players' Player of the Year as the Foxes won the Premier League in 2016. City walked away from a potential deal for Mahrez because the transfer package would have cost £95m. Leicester proposed a player-plus-cash deal, but City were not willing to spend more than £60m. I used to get changed next to Mahrez, he's pretty quiet, he gets on with his work and he's a well-liked character in the dressing room. He is an exceptional player and would be welcomed back with open arms. I think when he comes back he just has to get his head down and work hard. I know for a fact that he won't be an outcast because of this. Footballers know this is part and parcel of being a footballer. When he comes back there'll be a good bit of banter. I can understand from his point of view that he possibly had the chance of joining a club that could win four trophies this year and as a player you're always defined by how many trophies you've won. You can understand from his point of view. But at the same time if Leicester's valuation is this and Man City are not willing to meet it then the club are perfectly in their rights to do what they did. That's football. Riyad won't be the last person that happens to.